Home How To What makes your parent’s train travel with High Blood Pressure Safe? What makes your parent’s train travel with High Blood Pressure Safe? High blood pressure is one of the most common lifestyle diseases today. Every third person in India suffers from Hypertension. It is so common among the elderly that patients do not even think of it as an obstacle to their travel plans. But the health condition, in such instances, can deteriorate from just a bad feeling to a life-threatening state very quickly. This is why taking adequate prevention before embarking on a trip is very important for persons with high blood pressure. When travelling in Indian trains sudden emergence of critical symptoms is a big problem due to scant medical help at a station. In India each year, many cases of people falling sick during train travel due to high blood pressure are recorded. But that has not lead to improvement of facilities for patients in the train. They continue to be dismal! So, what makes the journey of your parent’s safe, if they have high blood pressure? 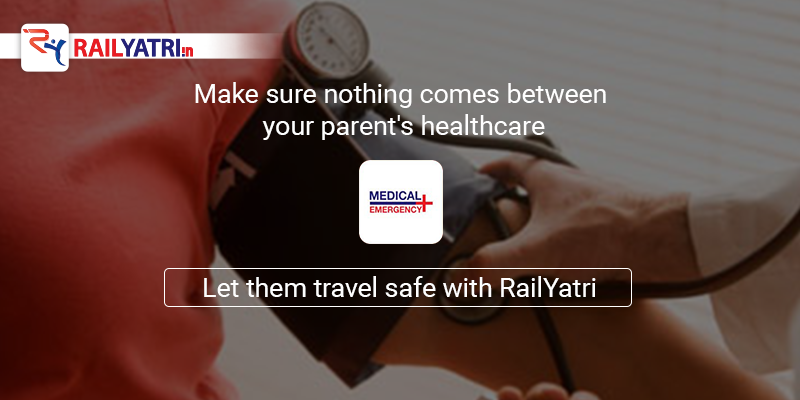 RailYatri’s new Medical Emergency feature does just that. How? One of my best friend’s father was travelling from Howrah to Bhubaneswar during the Durga Puja last year to spend some days with his elder son. Everything was going as planned, his father also took all the necessary precautions as he has high BP but what followed later in the journey actually got me worried about my loved one’s health while travelling. Would like to share with you the incident exactly as my friend Vikas narrated to me. “My father has been suffering from high blood pressure for more than five years now. Though his attending doctor, Dr. Hazra, has advised him to follow a strict diet, but he tends to overlook the warnings while travelling. One such incident hurt him badly. He was travelling in a Premium train, and in the early part of travel, he was fit and fine. But maybe he had some food from outside (which he never agrees to), his health started failing. He was seen clasping onto his chest, and having the problem in breathing. As he was travelling alone, he firstly tried his prescribed medicines, when it did not work he asked for help from fellow passengers. The ticket checker was summoned and he arranged for first aid medical facilities in the train. As my father later told me, the medical facility in trains (even the Premium ones) is limited to only to some basic medicines. With failing health, my father (I admire his braveness!) asked the ticket checker to ask for medical help at upcoming stations. A station about 1 hour away responded and he was stretchered off. On being taken directly to a Government hospital, it was learned that the hospital did not have any form of critical care facilities. So, he was again shifted to a nearby private nursing home. In the process, my father had to suffer two hours of agony! If you want to gift a safe journey to your parents every time, install the RailYatri app in their mobiles. Make sure that nothing comes between their health care! Nice post. I would share this among my friends. Because fathers are so important in our life because he is the one and only hero who holds our hand and teach us to face the hurdles exist in life. So, we always need to take care of him by all the way.